A while ago, while talking to a friend, I told her that making your own tribal bra was a bit of a rite of passage. 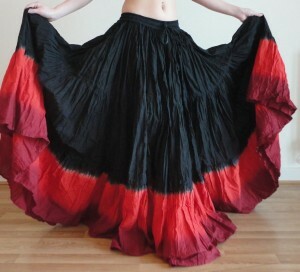 I was making it up (sort of), but getting a 25 yard skirt is DEFINITELY something you need to do at some point or other. Of course, if you’re on the curvier side, you might find this difficult. I have mentioned elsewhere how you can make one. Yes, that’s 12 metres, so about half the 25 yards touted as “standard”. You need a HUGE amount of fabric for making these, and while they’re easy to make, if you want something like a dip-die edge, you’re out of luck unless you want a LOT of extra work, which most of us can’t put in (or don’t have the facilities to do). Most local places have told me they were selling skirts, but none had anything I could pick and be certain that it would fit me right. So I turned to eBay to see if anybody was offering bigger sizes there. Turns out they weren’t, but a few inquiries did find me an indian manufacturer called Sai International more than willing to do it, for a price that was about £10 more than buying the amount of fabric my calculations told me I would need to make one. Sounded like a match made in heaven… almost. 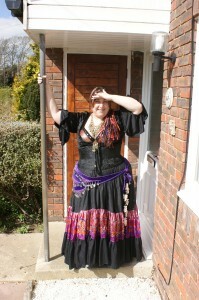 And today, after merely a couple of weeks, the skirt arrived. reasonably priced: about 1/3rd below the amount I would have been charged for an american standard skirt (without the extra charge for customisation for bigger sizes, and of course without the hideous shipping fees! ); around the same as one bought locally, but again, no chance at customisation…I think overall, with shipping, it was about £38. 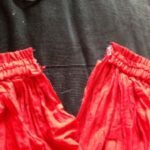 I’ve discussed the uneven hems in the past, I know this is a risk for fuller figures, and I have encountered it myself on nearly every single skirt that I’ve ever worn except those that I made myself to counteract for it. So this was expected. What I wasn’t expecting was that it would be SO noticeable. The monsterskirt, with its sari third tier, shows any unevenness VERY clearly, and lowly me, with little experience doing a skirt before, managed to make a 12-metre one that, when I have taken the time to arrange it properly, is STRAIGHT. You can see this clearly in the photo, where the edge is even at about 1″ from the floor. My new dip-dyed skirt hitches at the sides, and I’m not sure about the back because the fullness covers it, but I’m pretty sure the front is longer. And it’s also rather short for my liking. Granted, these issues are not deal-breakers if you’re using your skirts wrapped or hitched, they don’t matter, but me? I’d rather start from a flawless point, and not have to rely on hacks to mask the issues. I’ve found that, side by side, my 12 metre skirt doesn’t appear to be substantially smaller or less full than the new 25-yarder. So, to sum it up, what have we learnt today? Overall, I am a bit disappointed as I expected a bit more, but if you don’t tend to have problems with skirts off-the-peg, or for wrapping around, at the price these skirts are quite decent. I might order another one if I require a very specific colour, as finding suitable fabric for them seems to be difficult, but for the next one, probably an underskirt in cream or white? I’m definitely making my own. And a black one to follow too. Legal Disclosure: I was not paid for writing this review, nor I received any free service or product in exchange for it. thanks dear arien for the review .These much value for us.Will take care in future orders.